Arthritis and injuries sustained during sports and daily activities can leave you with joint pain and stiffness that often fail to respond to traditional therapies. When you struggle with ongoing joint problems, Dr. Keith, Dr. Chase, and Dr. Humiston at SoCal Regenerative Medical Clinics can help with joint injections that soothe the joint, promote healing, and relieve your pain. To learn more about joint injections, call one of the offices in West Covina or Anaheim, California, or schedule an appointment online. What conditions commonly cause joint pain? Your joints are frequently in motion, often repeating the same movements while supporting your body weight, not to mention the weight of objects you may carry or pick up. This continuous stress makes joints susceptible to injuries and degenerative diseases that cause ongoing pain. Joint problems can progressively worsen, leading to chronic pain. That’s when a joint injection can help. 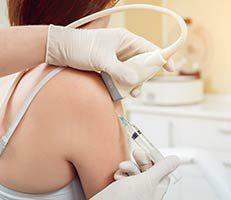 What types of joint injections are available? Viscosupplementation relieves the pain and stiffness of knee osteoarthritis by injecting hyaluronic acid into the joint. Hyaluronic acid is a natural part of your synovial fluid, which lubricates the joint and acts as a shock absorber. When you have arthritis, this important substance breaks down. Viscosupplementation restores your lost lubrication and helps preserve joint tissues, reducing your pain and improving knee movement. Throughout your life, adult stem cells heal damaged tissues by regenerating new cells. The doctors at SoCal Regenerative Medical Clinics can extract a sample of your own adult stem cells, then inject them into joints damaged by injuries and arthritis. After the stem cells are injected, they reduce inflammation, relieve pain, and promote healing by creating new cartilage, ligaments, tendons, muscles, and bone. Like stem cells, platelets are also one of your body’s natural healers. When you’re injured, platelets migrate to the damaged tissues and release growth factors that stimulate new tissue growth. The team at SoCal Regenerative Medical Clinics can take a sample of your blood, extract your own stem cells, then inject them into your damaged joint. This concentrated injection of PRP triggers the production of musculoskeletal tissues and blood vessels, reduces inflammation, and helps prevent degeneration of healthy tissues. Your joint injection is done in the office under local anesthesia. The doctors use advanced imaging that allows them to see the needle in real time. With this image-guided technique, they precisely place the needle where your injection achieves an optimal effect. If your life is limited with ongoing joint pain, call SoCal Regenerative Medical Clinics to schedule an evaluation and expert treatment with a joint injection.